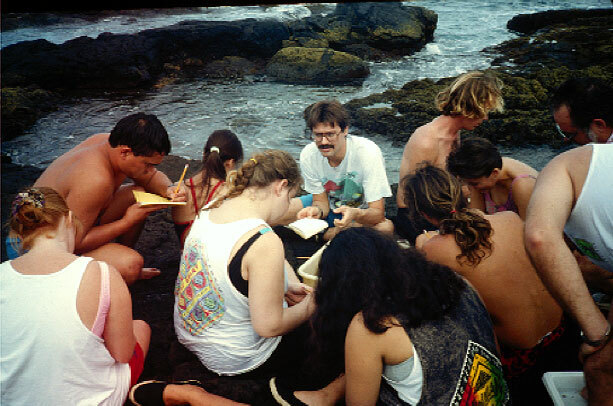 Me teaching coral reef ecology in Hawaii, 1999. Why do we mark the occasions in our life? We celebrate birthdays, anniversaries, weddings, graduations, and the seasons. Is that what life is really about? Is it a long period of the mundane punctuated by an occasional memorable event? Is life really about the dozen or so things that we cherish in photos, music, movies, and stories? There has to be more, right? Teaching classes at UH-Hilo, 1992. Photo: John Coney. When I reflect back on my life as a marine biologist, as a college professor, I’ve had a wonderful life. I have always loved the ocean and as a marine biologist I couldn’t have a better job. And so when I got my first job as an Assistant Professor at the University of Hawaii at Hilo, a small undergraduate liberal arts college on the island of Hawaii, I was ecstatic. As the first hire in a new marine science program I eagerly took on whatever came my way: a 12-month teaching load, advising 100s of students, research on coral reefs, talks at locals school and to the public, while at the same time starting a family. I felt invincible because I could do it all. And I did. For awhile. I was young, ambitious, passionate, and that goes a long way. But eventually things caught up with me and I started to tire. Classes came and went — marine biology, invertebrates, marine ecology — I taught a dozen different classes in all. But all the while I couldn’t get any research done, had few publications and almost no grants. Meanwhile coral reef health was declining and I needed to do something. But students were taking up all of my time: they were in my classes, my office; we went on field trips, scuba trips, hiking trips, went sailing; I watched hundreds of students graduate each year. It was great but relentless. And before you know it I felt the passion dim, slightly, but I could feel it. Teaching was the problem I thought, I have too many students and it’s keeping me from my life’s work: research. 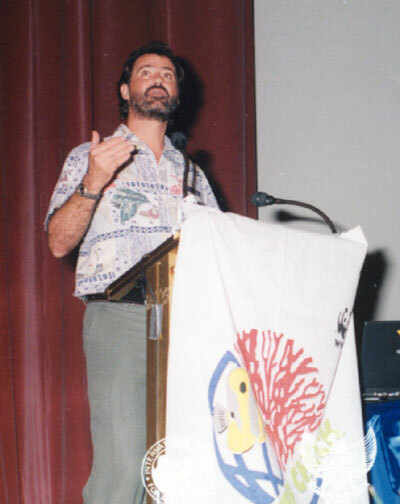 Giving a research talk at the International Coral Reef Symposium, Bali, 2000. And so I moved, left Hawaii and changed jobs, to a research university and into administration at Washington State University Vancouver, to start a new science program as a director. I still had my classes, but they weren’t marine, and I had students, but I didn’t spend much time in the classroom and changed my focus to graduate students. And it was great, fantastic. I started publishing regularly, received numerous grants to fund my work, was involved in major research programs on coral reefs, deep-sea fish and invertebrates, abalone, climate change. I made regular trips to major funding agencies in Washington DC, was interviewed on national media, gave talks and led sessions at national and international meetings, served on grant review boards. And I had wonderful graduate students: over a 15 year span I advised 18 masters and PhD students and I celebrated as they graduated and moved on. Time passed. Seven years as Science Director, five years as Associate Director, then I was promoted to full Professor. I helped build new buildings, equipped new labs, hired and mentored dozens of new faculty, attended fund-raisers, worked with lawmakers to change policy, and spent an ever-increasing amount of time in meetings. It was a fantastic time but I was starting to get lost in it all. I was forgetting what I was there for. Great accomplishments — yes — but I was driven more by my desire to be a respected scientist instead of conserving the ocean. Simply because the more well-known I was the more grants I would likely receive, the more publications I would get accepted, the more people would hear about my work. It went round and round. Research portfolio at WSU, 2007. Now don’t get me wrong: as an intellectual it was very satisfying to see years of research in the field being published in papers and to watch those papers influence the world and see the ocean become just a little bit healthier, the fish a little more common. After all the main reason I was doing all this was for my love of the ocean, to conserve the sea. And I was making a difference! But those occasional moments of success were entangled in the staggering fast-paced world of academia. A world where there was always a desire for more. To achieve something truly remarkable, however ill-defined that was. More pubs, more grants, more paperwork, more research, more, more, more. But the reality is that there was always somebody smarter than me, always a better scientist somewhere, somebody with more pubs, more grants, more awards, someone better as a department chair. It’s a very competitive field and rightfully so. But then it happened, slowly but inevitably. After 10, 15, 20 years I hit a wall. Burnout. The passion that once drove me was hanging by a thread. Literally sucked out by the relentless pace of my life. And the irony of it all is that I couldn’t point my finger at the culprit and say “it’s all your fault!.” I had only myself to blame. I felt like a failure of sorts for falling short of what was possible, of my own unbounded ambition. But in the end they were all my choices, my ambitions, my crazy life. I had to owe it. 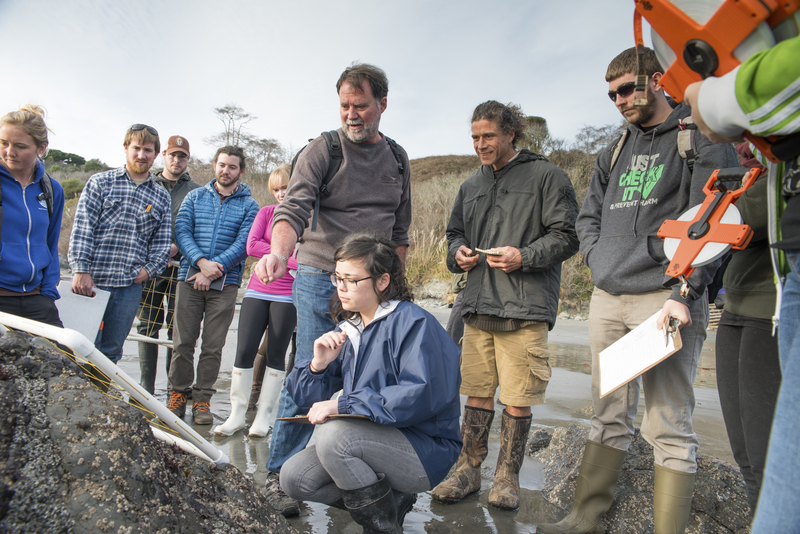 Teaching with my students in the field at Humboldt State University, 2015. Photo: Kellie Brown. So as our kids began to leave home for college my wife and I felt like it was time for a change. I was looking for a place to reclaim my passionate early days; to return to teaching marine biology, live near the ocean. And I did, to Humboldt State University as the director of the marine lab. I was still in administration and pursuing research, yes, but at my own pace in a supportive environment. 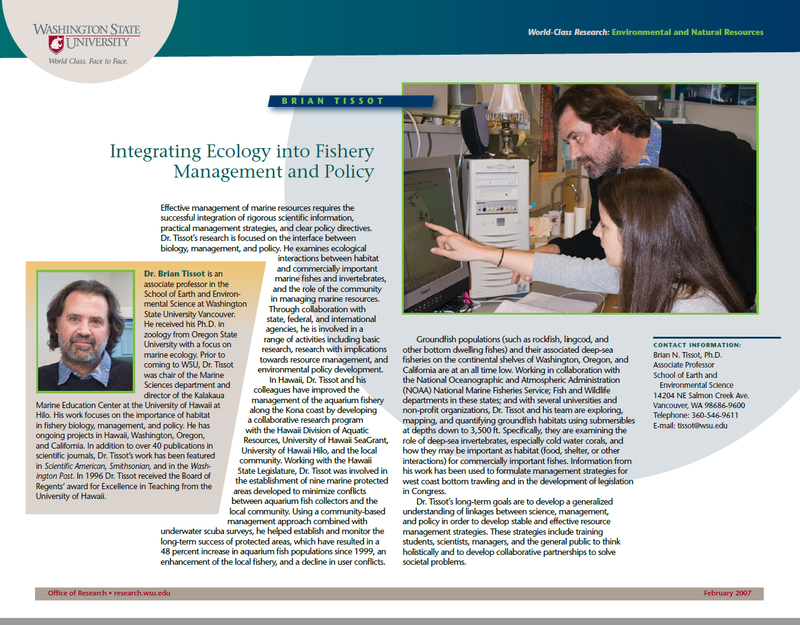 Very importantly I was able to create a synergy whereby my administration, research and teaching were all connected. And the common thread was what I loved, the ocean. And so recently I have been just living in that world and enjoying it, every day. 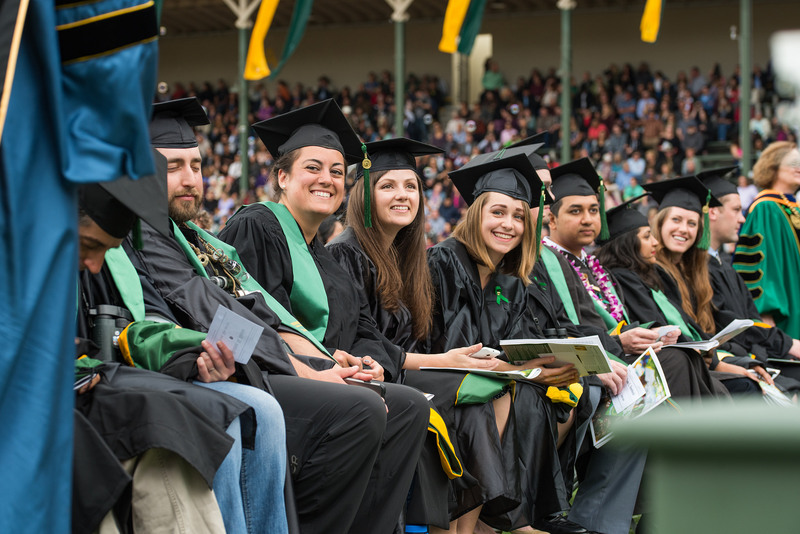 Humboldt State University students at commencement, 2016. Photo: HSU. But just last week, during our annual commencement ceremony, I was sitting in the front row as over 1,000 students walked by me after receiving their degrees. And it hit me that I had been doing this for 25 years; that I had sat with faculty just like this, year-after-year, watching thousands of students receive their hard-earned degrees and go out into the world. And for much of that time I was somehow dissatisfied with my life because I felt I wasn’t achieving what I should be doing as a professor: conducting research to save the reefs. And as a sat there, for truly the first time, I looked at each and every student’s face as they received their degree. And what I saw was amazing: joy. Pure joy. Every one, every one, walked off that stage just beaming at the world. They were changed. College had done that, the faculty had done that, I had done that. 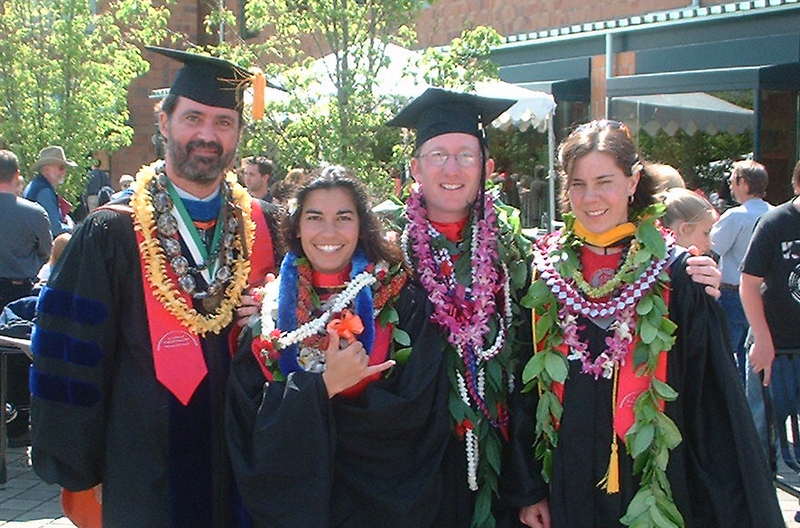 Me with my first two graduate students (from left): Noelani Puniwai, and Jonathan Hultquist and fellow graduate Tabitha Reeder, in 2001. And then a wave of emotion washed over me as I thought back over my life as a professor, on the flow of people who had moved through my life. Of all the wonderful students I’ve had the privileged of teaching and being part of their lives. Of the absolutely amazing opportunity I’ve had as a professor to study what I love and spend my whole life teaching others about it. About how precious the ocean and its life is and how to conduct the science to understand and protect it. And then I remembered back to all the college students I had taught, tried to remember their faces, their questions in class, talks we had in my office, or on a field trip. I remembered their occasional family crisis, the lack of confidence, the fear of failure, the anxieties of not being successful, or of not getting a job, or advice on career choices. I then recalled the rare phone call, the occasional letter or card or e-mail from a former student. Many of them now scientists, doctors, teachers, lawyers, nurses, some are federal and state biologists and help manage natural resources, others work for non-profits, or at parks, aquariums and zoos, and quite a few are not involved in science at all. More importantly almost all were happy and fondly remember their days in college as a turning point in their lives, regardless of where they ended up. And when they thank me — many years later — for being an inspiring teacher, or for a particular class, for help tackling a tough assignment, for advice and support when they needed it; when they thank me for helping to change their life: right there, that moment, is much bigger then all those events I had marked in my scholarly life. It wasn’t that those events weren’t important, they were! But I felt like Mr. Holland. A man who toiled in the high school classroom for 30 years and felt he was a failure for not writing his famous symphony, falling short of his life’s work. Through my passion I had helped hundreds, perhaps thousands, of my students to learn to understand, love and respect the sea but also to conserve the ocean, in their own way. They are my life’s work, the greatest part of my professional life, and through them my love for the sea lives on and reaches more people than I can possibly imagine. Collectively they are much more powerful than any research because working together we can achieve more. And although it took me 25 years, I finally learned that lesson; and it is a masterpiece. And there is a bigger lesson here too. This is my life, my trajectory, my reflections. What are yours? We all live our lives and touch others in ways known and unknown. What is the bigger picture of your life? Who have you influenced and what have they done? Is there a teacher in your life you need to call? We aren’t here alone. We are all in this life together. Each day with new possibilities, new experiences, not knowing where it comes or where it goes. So we need to make each day count — but don’t forget the big picture. Brian, Sandie forwarded me your article, “Mr. Holland’s Opus, My Life as a College Professor”. Well written and so insightful. I too have been very busy over the last 50 years or so working, staying very busy, lot’s of accomplishments and successes, but I too have assisted hundreds, maybe thousands to find their gifts and fulfillment in their lives as well. God did not create us to live alone but in relationship with others. Thanks Jeff and I’m sure you have lived a busy life! As you know we each touch so many others in unknown ways and I’m sure you have done this through your many positions, especially in education. I hope you and your family are doing well. Your father visited my Grandmother years ago…and my Aunt Connie in San Diego.